. Interact with the applet below for a minute by dragging the white point along the arccosine curve. The graph of the derivative of this function will be traced out in gray. Without looking it up on another tab, use the SAME LOGIC and METHOD OF IMPLICIT DIFFERENTIATION you used in completing the derivative of the arcsine function worksheet﻿ to find the derivative of the arccosine function. 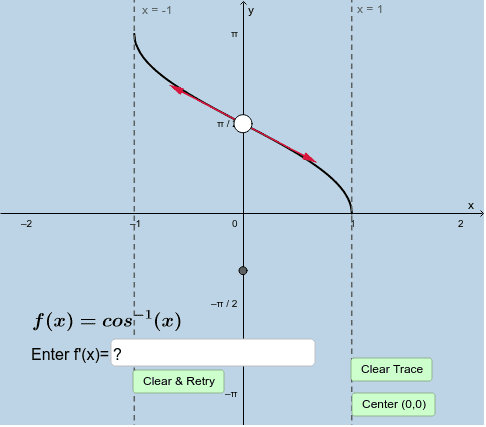 After doing so, enter this function into the input box to see how it compares to your gray trace!